A map is a graphic representation or scale model of spatial concepts. It is a means for conveying geographic information. Maps are a universal medium for communication, easily understood and appreciated by most people, regardless of language or culture. Incorporated in a map is the understanding that it is a “snapshot” of an idea, a single picture, a selection of concepts from a constantly changing database of geographic information (Merriam 1996). Old maps provide much information about what was known in past times, as well as the philosophy and cultural basis of the map, which were often much different from modern cartography. Maps are one means by which scientists distribute their ideas and pass them on to future generations (Merriam 1996). Cartography is the art and science of making maps. The oldest known maps are preserved on Babylonian clay tablets from about 2300 B.C. Cartography was considerably advanced in ancient Greece. The concept of a spherical Earth was well known among Greek philosophers by the time of Aristotle (ca. 350 B.C.) and has been accepted by all geographers since. Greek and Roman cartography reached a culmination with Claudius Ptolemaeus (Ptolemy, about A.D. 85-165). His “world map” depicted the Old World from about 60°N to 30°S latitudes. He wrote a monumental work, Guide to Geography (Geographike hyphygesis), which remained an authorative reference on world geography until the Renaissance. Ptolemy”s map of the world, about A.D. 150, republished in 1482. Notice the use of latitude and longitude lines and the distinctive projection of this map. Taken from Whitfield (1994, p. 8-9). Click on small image to see full-sized (206 kb) version. During the Medieval period, European maps were dominated by religious views. The T-O map was common. In this map format, Jerusalem was depicted at the center and east was oriented toward the map top. Viking explorations in the North Atlantic gradually were incorporated into the world view beginning in the 12th buy Viagra 100mg online century. Meanwhile, cartography developed along more practical and realistic lines in Arabic lands, including the Mediterranean region. All maps were, of course, drawn and illuminated by hand, which made the distribution of maps extremely limited. 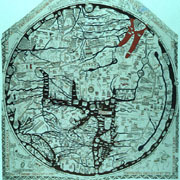 Hereford Mappa Mundi, about 1300, Hereford Cathedral, England. A classic “T-O” map with Jerusalem at center and east toward the top. Taken from Whitfield (1994, p. 21). Click on small image to see full-sized (159 kb) version. The invention of printing made maps much more widely available beginning in the 15th century. Maps were at first printed using carved wooden blocks. Printing with engraved copper plates appeared in the 16th century and continued to be the standard until photographic techniques were developed. Major advances in cartography took place during the Age of Exploration in the 15th and 16th centuries. Map makers responded with navigation charts, which depicted coast lines, islands, rivers, harbors, and features of sailing interest. Compass lines and other navigation aids were included. Such maps were held in great value for economic, military, and diplomatic purposes, and so were often treated as national or commercial secrets–classified or proprietary maps. Detail of Ptolemy and “old world” from Waldseemüller”s world map, 1507. This detail depicts the Old World in the Ptolemaic projection. Taken from Whitfield (1994, p. 11). Click on small image to see full-sized (126 kb) version. Map of the Danish Kingdom, 1629, by Janssonius. A high level of geographic accuracy is demonstrated along with marginal illustrations that enhance the map. Reproduction of original map from the Geodetical Institute of Denmark. Click on small image to see full-sized (184 kb) version. Merriam, D.F. 1996. Kansas 19th century geologic maps. Kansas Academy of Science, Transactions 99:95-114. Nyerges, T.L. 1993. Understanding the scope of GIS: Its relationship to environmental modeling. In Goodchild, M.F., Parks, B.O. and Steyaert, L.T. (eds. ), Environmental modeling with GIS, p. 75-93. Oxford Univ. Press, 488 p.
Whitfield, P. 1994. The image of the world: 20 centuries of world maps. Pomegranate Artbooks, San Francisco, 144 p.